If you follow me on Instagram, you’ve probably figured out that I’m passionate about anything and everything to do with makeup, fashion, coffee, wine, and running, although not necessarily in that order, LOL. And if you follow my Instagram stories, you’ve undoubtedly heard me whine A LOT about a foot injury that forced me to give up running and stylish shoes for 9 weeks this past fall. I guess it would’ve felt a bit less devastating if the injury had occurred as a result of completing my first full marathon or performing some sort of heroic act, but the truth is that the whole ordeal started when I walked into a half-open door at full speed and broke one of my toes. I initially thought I’d just stubbed it really badly, but when the pain and swelling got progressively worse over the course of 3 days and I found it increasingly more difficult to walk, I decided I needed medical attention. I can’t say I was surprised when the doctor showed me the break on my x-ray, but I hadn’t anticipated that the recovery would take 6-10 weeks, nor was I prepared for the secondary muscle and soft tissue damage I would endure as a result of being unable to put pressure on one side of my foot for so long. And did I mention I fell and re-broke my toe halfway into my recovery? Fun times. About a week after I broke my toe, I found myself completely climbing the walls. I was so used to running 5-6 times per week, and my injury made me realize how much I had come to depend on my daily treadmill sessions to help me cope with stress and anxiety and all of the demands that come with balancing motherhood and a full-time career. Once I realized this, I knew I had to find another outlet, and when my physiotherapist told me stationary bike workouts are low impact and safe for injuries such as the ones I was trying to heal from, I almost wept with relief. I’ve always enjoyed a good spin class, and when I started poking around online, I realized there are now tons of free stationary bike workouts you can stream on your smartphone or tablet (see below for 4 of my favorites), and that there are lots of other options too. A Pelaton bike was out of my budget, but I soon realized I could create my own spinning studio right in my basement! I ordered an inexpensive stationary bike from Amazon as well as an iPad holder, and then I tested out a bunch of different options. I streamed YouTube videos while I got comfortable with spinning again, then I signed up for a free 30-day trial of Studio SWEAT onDemand where I could access all kinds of spin classes for free (download the iPad app HERE and the iPhone app HERE to take advantage of their free trial! ), and then I created my own workouts and playlists which made me feel much more excited and in control. I’m so excited to share everything I learned on my road to recovery! What Are the Benefits of Stationary Bike Workouts? 1) Weight loss. While this may seem obvious, most people don’t realize just how many calories you can burn on an exercise bike. Of course, total calories burned depends on additional factors, like your weight, height, and fitness level, as well as the intensity and length of your sweat sesh, but many experts agree that 45 minutes of cycling can burn 350-600 calories! 2) Low impact. While cycling is definitely an aerobic activity, it doesn’t put stress on your hip, knee, and ankle joints. 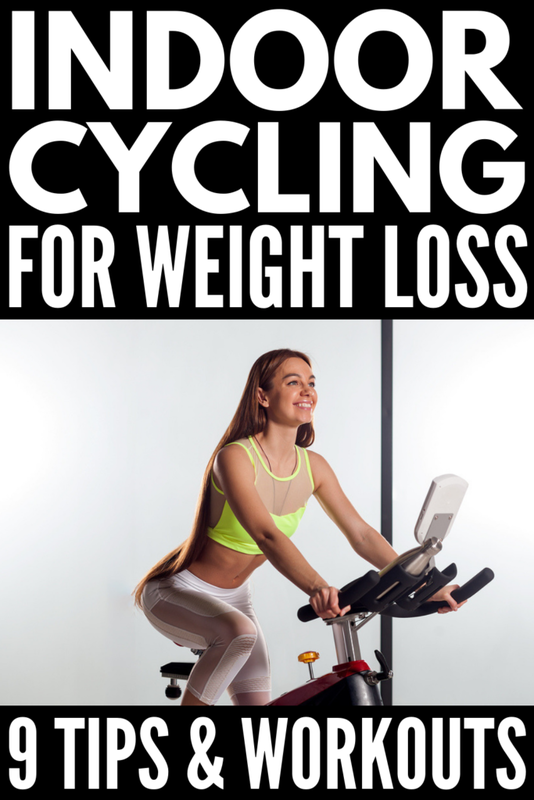 Cycling is also less strenuous on your lower back compared to other exercises like running. Whether you’re an injured athlete, suffer from joint and/or back pain, or you’re looking for a low impact workout you can enjoy on recovery days, indoor cycling is a great option to consider. 3) Great cardiovascular workout. You’ve probably heard that adults should get at least 30 minutes of moderate physical activity 5 times a week to lower their risk of developing high blood pressure, stroke, coronary heart disease, type 2 diabetes, depression, and certain cancers while also preventing injuries. Indoor cycling is a simple and fun way to meet this goal for those who can’t participate in high impact activities as well as those who need low impact options for recovery days. 4) Helps strengthen the muscles in your lower body. One of my favorite benefits of stationary bike workouts is that it’s a great lower body workout. Indoor cycling offers a great way to strengthen your glutes and quads, and can also tone your arms, abs, chest, and back muscles. 5) Stress management. Whether you’re participating in a spin class at your local spin studio, or enjoying one of the at-home stationary bike workouts for weight loss we’ve shared below, one thing is for certain: indoor cycling releases feel-good endorphins and reduces cortisol levels, which helps you feel more energized, lowers your stress levels, and improves your immune function. 1) Seat position matters. If your seat is too low, you can end up with knee pain, and if your seat is too high, you won’t be able to pedal efficiently during your workout. Make sure your seat is parallel your hip bone when you’re standing next to your bike, and make adjustments as needed once you’re on the bike for maximum comfort. 2) Handlebars are for balance only. Indoor cycling is designed as a lower body workout, so you shouldn’t be hanging onto the handlebars for dear life when you’re pedalling. Instead, you should be concentrating on using the muscles in your legs throughout your workout, and you should only use the handlebars to help you remain balanced. 3) Don’t sway your body! You want to keep your body tight and stationary while you’re cycling to ensure you are engaging and exercising your muscles correctly. Your body should not be rocking from side to side. Give it a try and you will notice that remaining stationary is a much more challenging (and effective) workout! 4) Tension versus speed. One of the biggest mistakes I used to make in spin classes is that I would opt for speed over tension. It often felt like the bike was going to completely crumble beneath my body during sprints, and I often felt like my legs had a life of their own when I was engaging in high speeds. I later learned that adding resistance to the bike not only allowed me greater control over my body and bike, but it also made the workout more challenging, leading to greater weight loss and lower body strengthening. 5) Consider a saddle cover. You’re probably not going to do this if you’re working out at a gym or cycle studio, but if you own your own indoor bike and find the saddle causes pain in your bum, you might consider purchasing a gel bike seat cover for more comfort. 6) Invest in a pair of cycling shoes. My last tip for those who want to know how to get the best workout on a stationary bike is to invest in a pair of cycling shoes. These are designed to lock your foot into place on the pedal of the bike, which helps increase your pedal power for a more efficient workout. Wearing cycling shoes can also help prevent foot pain and reduce cramping. If you’re looking for stationary bike workouts for beginners, this is a great one to try. It’s a great way to familiarize yourself with what a spin class entails, and since it was filmed in a spin studio, you’ll get a sense for what it would be like to participate in an actual class. I also like that she switches it up and keeps it fun and engaging! Have you ever heard of Studio SWEAT onDemand? They have an app you can purchase and download to your smartphone or tablet, where you can access all kinds of workouts, including stationary bike workouts! Give the sample spin class above a try and if you’re interested in a free trial, download the iPad app HERE and the iPhone app HERE. Don’t let the fact that this workout is only 20 minutes fool you! With a combination of high and low intensity intervals, your heart will be racing and your fat will be crying! A collection of stationary bike workouts wouldn’t be complete if I didn’t share something from FitnessBlender, which is one of my favorite fitness channels on YouTube. This workout is a little different in that the instructor isn’t using a proper indoor bike (watch the video to see what I mean! ), but the workout is still effective and will definitely work you into a sweat! Whether you’re an injured runner like me, or just need a low impact sport you can enjoy for weight loss and/or on recovery days, I hope this collection of stationary bike workouts as well as the advice I shared proves useful to you! If you liked this collection of stationary bike workouts, please share this post on Pinterest! And if you’re looking for more fitness tips and workouts, please follow our Fitness board where we share all kinds of fabulous ideas we find each day!